I’d been working on a post about Brussels sprouts, when all of a sudden I woke up one morning and Wham! was on the radio singing “Last Christmas”, and the tree people had come down from Vermont to re-forest the corner of Kane & Clinton. This means, by necessity, that letters for Santa have been painstakingly scrawled in childish hand, and Good Curious Elf has begun his nightly patrols. We’ve already been swept into the whirlwind of the Christmas Spectacular and tree viewing at Rockefeller Center, and we've handed the tots off to the grandparents for the more onerous Manhattan errands. So suddenly, shredded Brussels sprouts with lemon and cappellini, as much as I love that dish, seems colossally un-special. 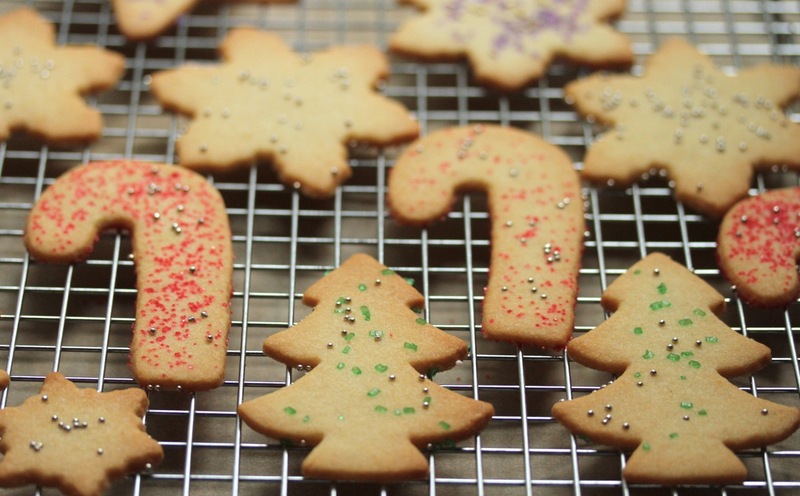 It’s time for some baking, and I’d like to share a cookie recipe that, for us, always kick-starts the holiday season. It’s not the most original one you’ll see in this year’s cookie line-up, but it was my great-grandmother’s. That sounds even more impressive when I tell my daughters we are baking their great-great grandmother’s cookies, the ones my mom used to make with my sister and me every December. Mrs. Julia Butterworth, known as “Juju,” lived in the tiny town of DeWitt, VA. This is not the first time I’ve written about her here. Since she reached the venerable age of 96 I got to know her for a handful of years, but those being my youngest years I only caught her in glimpses, which at this point in my life have gotten muddled together in a grainy black-and-white montage. I imagine her with a nimbus of snow-white hair and old-fashioned eyeglasses, slimly built and simply dressed, with a sweet, old-lady smile. I suppose, now, I know her more from Mom’s stories than anything else and can almost feel the feeling of climbing in between cold sheets in her guest bedroom, peering out at the dark shadows that gathered in the corners of her old farmhouse. I can hear the birds chirp in the morning as I imagine stealing into her garden to pull sweet young turnips from the dirt, warm underfoot in the Virginia sun. And so, following her recipe for “tea cakes,” rolling out the buttery dough and pressing down onto the cookie cutters and snapping a crisp cookie between my teeth, I almost believe I can visit with her for a while and bring my daughters along to meet her. They don’t yet appreciate time passed and memories preserved as I do, but they adore a good tea cake and beg for them year round. 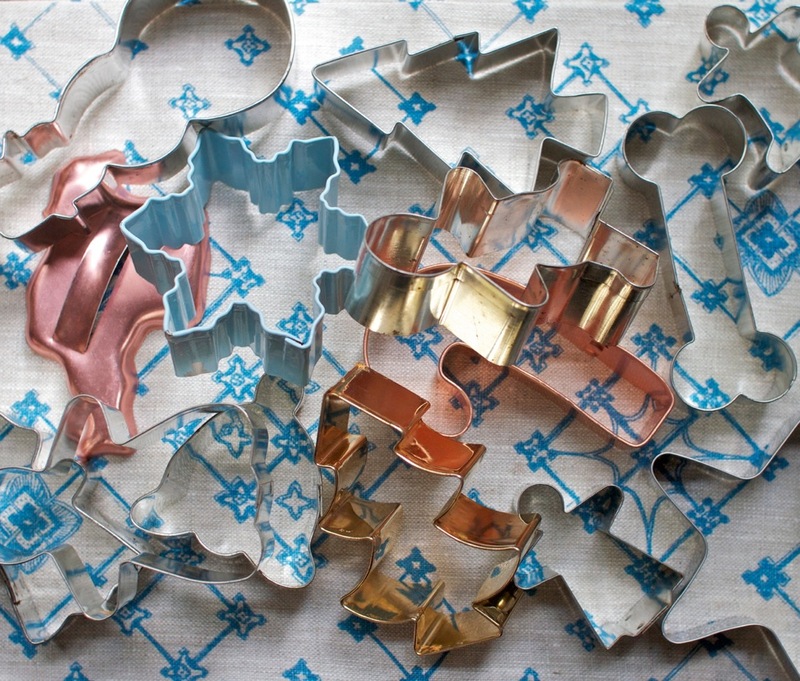 We’ve been known to pull out this recipe at Halloween or Valentine’s Day, too, merely as an excuse to wield cookie cutters. There’s nothing especially elaborate or new about this recipe, it’s just a good, solid one for this old-fashioned type of cookie, which inhabits the space somewhere between a butter cookie and a sugar cookie. In spite of what the name might suggest, there’s nothing cake-y about them–especially when rolled thin as we’re in the habit of doing in my family. Juju had two different versions: the “everyday” ones baked with Fluffo instead of butter and cut thicker in the shapes of bunnies, with raisins for eyes…and then the fancy “tea cake” rendition for special occasions: made with real butter, rolled thin, cut in a variety of shapes, and decorated prettily with sprinkles. That’s the kind my mother made with us at Christmas. It was part of her slim repertoire of sweet treats, and in fact the only thing we ever baked during the holiday season. But she was a decent baker and had her opinions about how things should be done. 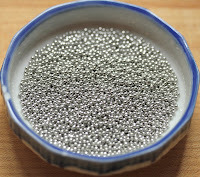 The dough had to be stretched whisper-thin and lightly adorned, preferably with 4mm silver dragees. My sister and I used to torture her by loading on the colored sugar, as much as a cookie could physically hold, as soon as she turned her head…and gleefully watched her horror when she turned back around to discover our handiwork. As I make these cookies with my daughters every year, I catch myself falling into the same OCD patterns, tensing up as they pile on the crystallized red dye #5. But I hold myself back, letting them unleash their little creative demons. Around here, it’s not Christmas until a round of these cookies gets made, and flour dusts the whole kitchen, and the house fills with their buttery-sweet smell. I do roll them wafer thin, a habit which demands a little more work and watchfulness (they burn in a flash). My preference is for cookies that are golden and a little toasty around the edges, with a hint of caramelized flavor. 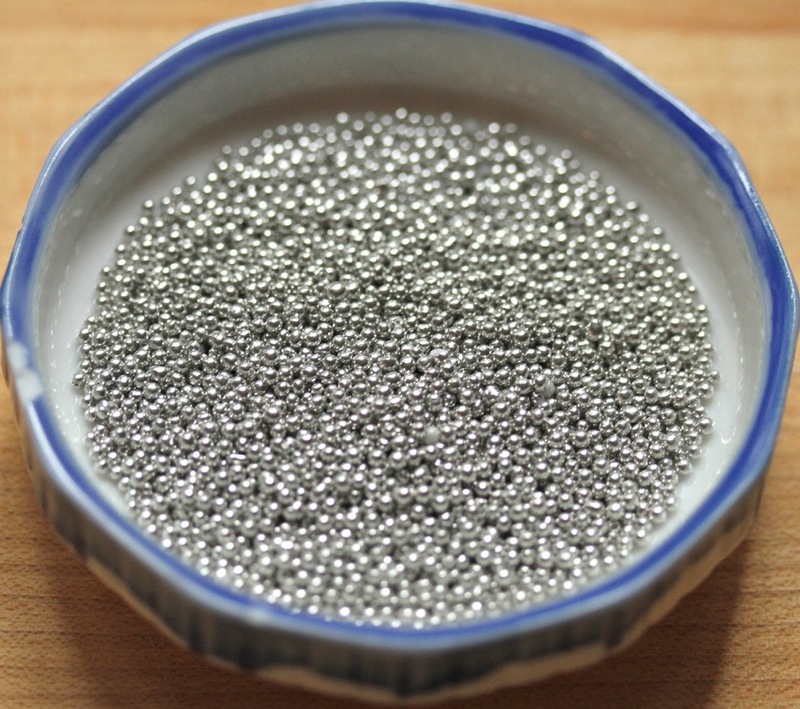 I am also partial to the glittering dragees, even though I’m not quite sure what sort of metals we’re ingesting (note: I prefer the 2mm size to the 4mm; they’re more like birdshot than BBs and much gentler on the teeth). Brooklynites can find all sorts of pretty sprinkles, dragees, and cutters at A Cook’s Companion on Atlantic. 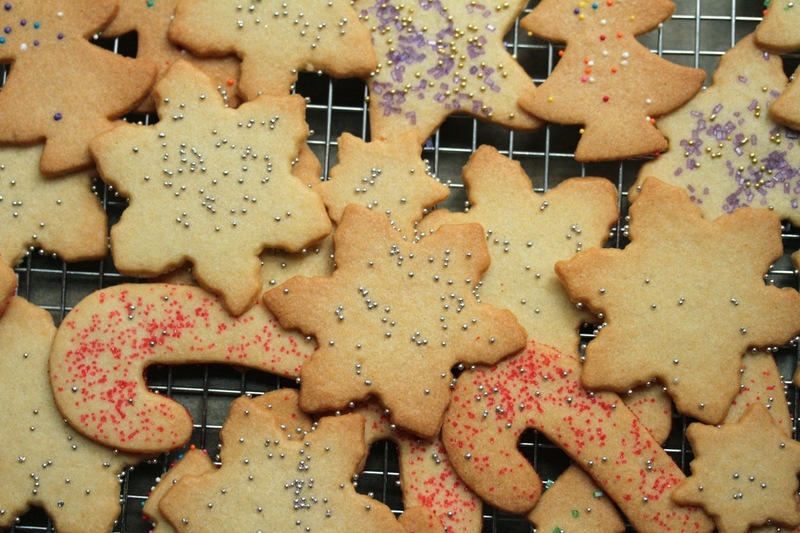 Truly, the best thing about these cookies always was–and still is–the raw dough. Rich and vanilla-scented, with a sugary crunch between the teeth, it is the very essence of what cookie dough should be, and there is no better anywhere. I still gobble up the scraps as I roll and cut. Mom used to give us each a beater off her 1968 hand mixer–the one she still owns in spite of the gaping hole in its casing and exposed wiring and gears within (“I keep things until they die,” she'll proudly tell you). We would strip off every atom of dough with our tongues and stick our heads into the empty mixing bowl for good measure, until somewhere along the line there was a salmonella scare, and a dough-laden beater acquired the same, suburban menace as a raccoon out in daylight or unwrapped candy on Halloween. It became every parent’s responsibility to keep cookie dough away from children’s mouths, and so Mom fell in line. Still, we managed to swipe our fingers in the dough bowl while she wasn’t looking and later, growing bolder, to steal down to the refrigerator where the dough rested, peel back the plastic wrap and break off hunks of chilled dough, which was even better, somehow, than it had been at the freshly-whipped stage. After she got wise to our ways and threatened to cut us off from Christmas sweets forever, our deceptions grew more intricate, and we honed the art of opening the fridge swiftly with a well-timed cough to mask the sound, and with a potter’s skill, of molding the dough back into place after prying off a sugary chunk. Enjoy this recipe any way you like: pressed thin, left thick, modestly or garishly sprinkled, iced, pale, tawny at the edges, or burnt to a crisp. Enjoy the meditation of flouring the board and rolling out the dough. And if you happen to be making these with kids, savor the way you're forced to slow down a bit during the holiday season. Let go of your control freak side for a moment and make a terrible, floury, sprinkly mess. With an electric mixer, cream together butter and sugar until light and fluffy. Add eggs and vanilla and beat until combined. Sift dry ingredients together into a separate bowl, then add to the butter mixture in two additions. Mix until just combined. Scrape out of bowl and shape roughly into four disks, wrapping in plastic wrap or parchment. Chill for at least an hour, or overnight, until firm. When ready to make cookies, preheat oven to 350º. Leave dough out at room temperature for 20 minutes or so, until softened and workable but still cold and somewhat firm. Prepare trays with either parchment or silpat. Ready a clean surface and rolling pin, along with some extra flour for dusting. 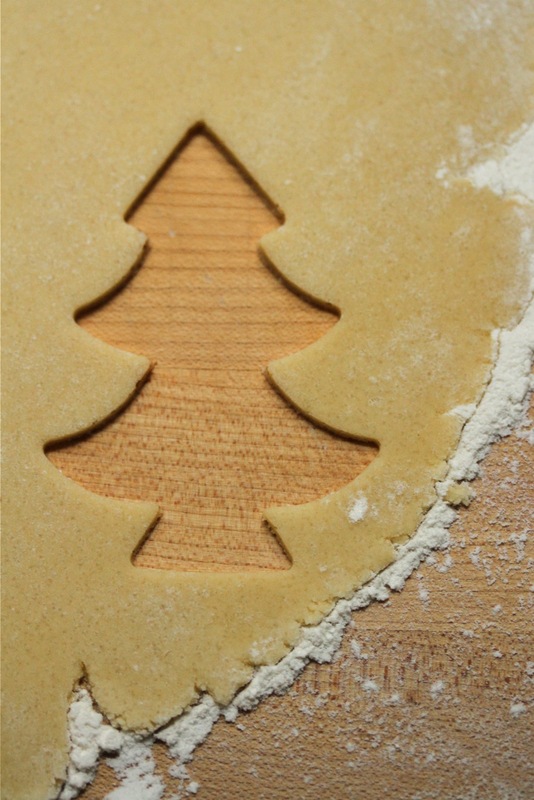 Lightly dust your work surface and rolling pin and roll out cookie dough, working from the center outward and rotating the disk for the most even thickness. When you’ve reached about between 1/8" and 1/16” thickness (or as desired), cut out your cookies with floured cutters of your choice. Transfer to prepared cookie sheets (a dough scraper really helps) and decorate as desired. Bake, checking frequently, between 15 and 25 minutes. Ovens vary widely, and much depends on how thinly you've rolled your dough. When done to your likeness (I like them golden around the edges), remove tray from oven and cool cookies before handling. They keep in an airtight container for a couple of weeks.